Once you have created a "hatch" you can change it. If we use it, and then select the Hatch to edit, will reopen the same window of “classic” insertion and we can update the various values. 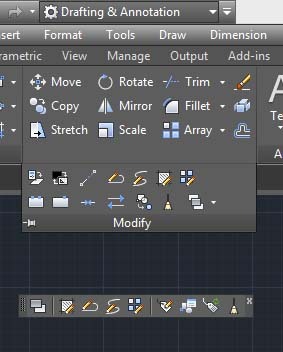 Using AutoCAD with the “ribbon”, simply select an existing Hatch to reactivate the edit bar at the top of the screen. As you've seen, a hatch is a set of lines and/or points, but once it is created as a single object. If you remember the polyline or polygon has a similar feature, as though with segments appear as a single object. If we use the command "explode" and select one or more of the items mentioned and then "Enter" them explode in the individual component parts, lines and/or points that may be. This with the textures is not always advisable as it exploded, a hatch can not be edited and modified, and if we were to cancel it would be inappropriate in terms of time and patience.